10 Car Seat Mistakes and How to Avoid Them and Keep your Baby Safe! There is a lot that is involved in selecting the right car seat for your child. Not only do you have to make a decision about which seat you want, but you then also have to worry about installing it properly. Even the safest car seat in the world can pose a major safety risk if it is not installed properly. Various elements such as the harness, headrest, and base must also be positioned and used correctly. It can feel overwhelming! Of course your child’s safety is your number one priority, and you would never willingly do anything to put them in danger. However, it is far too common that parents make mistakes when purchasing, installing, or using a car seat with their child. 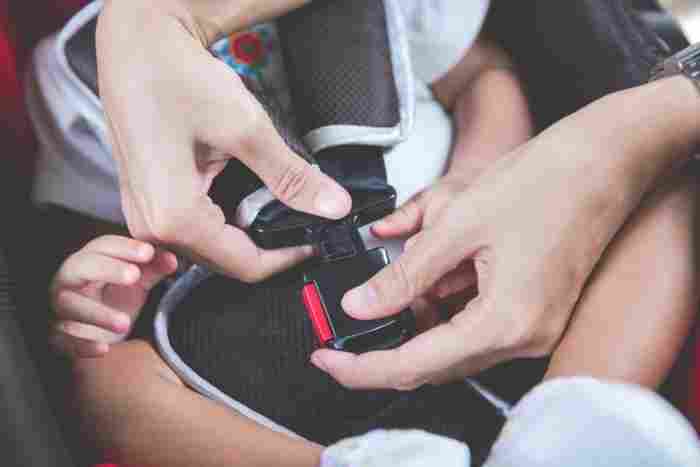 To try and avoid this from happening, take a look at these ten common car seat mistakes, along with solutions for how to fix them. This is the biggest problem you will run into! So many parents make the mistake of not installing their car seat correctly. While this is an understandable problem, as some models can be confusing, it is a problem that you really cannot afford to make. Nothing is more important than your child’s safety. If you are not entirely sure how to install the seat, do not simply guess and hope that it is installed properly. How to avoid it: Good news! If you do not know how to install the car seat you purchase, you have tons of resources to help you out. First- check the Internet. Many brands will upload video tutorials on their website or social media channels showing how to properly install their seats. These videos may be just the help you need to help you figure out the installation process yourself. If not, hire a professional! Do not feel ashamed if you cannot figure it out yourself, as countless parents are in your same position. Hire someone that is specifically trained in this area to ensure your seat is properly installed. While you might think that all you need to keep your child safe is the right car seat, that is not true. Not only do you need a good seat, it needs to be positioned properly in your car. The only place a child should ever be situated in your car is the back seat. Do not attempt to install a car seat in the front seat of your car. It is dangerous for a child to be in the front seat, even if you think they are safer because you can easier keep an eye on them. Installing the seat securely in the back of your car is the safest and only option you should ever consider. How to avoid it: This is an easy one…install the seat in the back seat. No matter how safe a brand of car you drive, even if you have advanced safety features, there is no exception to this rule. It can be easy to purchase a seat and simply install it and forget about everything else. However, you need to be aware of what your particular car seat can handle. If you own a convertible car seat, you also need to understand when the seat should be switched to a different position or “mode” based on the size of your child. Each seat will have very particular size and weight requirements, and you should follow them exactly. If the seat cannot be used when a child weighs more than 50 pounds, this is not a rough estimate. Once your child weighs 50 pounds, you need a new seat. How to avoid it: If you do not want to deal with purchasing multiple car seats to keep up with your growing child, your best option is to purchase a convertible car seat that adjusts as your child grows. While you still need to check the weight and height requirements, you at least know that you can keep the same seat as your child grows. Check the numbers on your seat and write it down somewhere or put it in your cell phone to help you remember. This is a problem that can have severe consequences, but a lot of parents aren’t even aware that this is important. Car seats need to be angled properly when they are used rear facing so that your child is positioned so that they are comfortable and aren’t slouching forward. Seats that are angled too far forward can cause your child’s head to fall forward. However, keep in mind you also do not want your seat to be completely vertical. Finding the right balance (typically around 45 degrees, but check your specific model) will be incredibly important. How to avoid it: Thankfully, many seats come with some sort of level indicator that will help you figure out the proper placement of the car seat. If you are struggling to get the angle right, you may have to place a rolled up towel under the front edge of the seat. As always, if you are not sure that something is right, check with a professional before letting your child ride with you. While it might be a bit harder to monitor your child when they are rear facing, this is the safest position for them. Both the NHTSA and the AAP agree a child should be rear facing until they are two or three years of age. Often times convertible car seats list that a child may switch to front facing when they are much smaller than an average three year old, but this does not mean you have to switch them at that point. It is in yours and your child’s best interest to stay rear facing as long as is possible for your particular car seat model. How to avoid it: Not only should you keep your child rear facing as long as is possible given the height and weight limits for your seat, you should also select a seat that has a higher rear facing limit to begin with. The average weight of a three year old child is around 30 or 31 pounds, so consider purchasing a seat that has that high of a weight limit when used as a rear facing seat. It is a common mistake that parents fasten their child’s harness too loosely. It can be tempting to loosely secure the harness, as you do not want to make your child uncomfortable. However, what is most safe and comforting to your child is to tightly and securely fasten their harness. You should only be able to fit one finger under the harness. If you can fit more fingers, the harness is too loose. A tight harness will keep your child securely in place, even in the event of a car accident. How to avoid it: Another easy solution, just tighten the harness! While you don’t want it to be too tight, do not be afraid to tighten the harness enough so that your child is secure. This is another mistake parents make similar to switching from rear to front facing too quickly. Do not rush switching your child from a car seat into a booster seat, as this can be very dangerous if your child is too small and could therefore majorly be at risk in the event of a car accident. Also, do not pay too much attention to suggested ages when children should be in a booster seat. Your child might reach the average age, but if they are not big enough, it will not be safe. How to avoid it: Check the height and weight requirements for the booster seat you are planning to use with your child. If your child is below either number, wait to switch them! Additionally, do not feel pressured to switch your child right when the reach the lower end of the limit. Safety should always be most important. This is a common mistake that parents run into as they start traveling with their child. It is easy to think that you only need to worry about having a car seat when traveling in a car, but that is not the case. Any time your child is in a moving vehicle they should be securely fastened into a seat. If you are traveling on a plane, train, or subway, you should take your car seat with you. It may be a bit of a pain to travel with a car seat, but as always, your child’s safety is always more important. It may be tempting to just travel with them sitting on your lap, but this is not the best option. How to avoid it: Make sure you have a car seat that you can easily remove and take with you when you travel. If you are financially able to, consider investing in a separate car seat that is lightweight and will be easy to grab and take with you. When the weather gets cold, of course you will dress your child in thicker sweaters and coats to keep them warm. However, bulky clothing is actually very dangerous when it comes to strapping your child into their car seat. If you happen to get into a car accident, the clothing would easily compress as a result of the force, which would result in the harness actually being too loose. With a loose harness, your child will whip forward and can be seriously injured. This is something most parents are not even aware of, but is a very serious risk. How to avoid it: Make sure to bring your child’s sweater and coat with you when you travel, but do not have them wear it while riding in the car. Instead, buckle them into their seat wearing non-bulky clothing and place a warm blanket over the top of the harness to keep them warm. Finally, the absolute worst mistake you can make is to make a decision to travel with your child without the use of a car seat. While the majority of parents would not consider this in their day to day travels, there are certain occasions where you might think it is alright. For example, if you are trying to fit another person in the car, you might think it is fine to just hold your child on your lap. While this may be tempting, it is far too dangerous. How to avoid it: Never offer to remove your child’s car seat in order to make room for other passengers. Your child’s safety is always most important, even if you are just going on a short car trip.